It is an amazing time when a baby turns one. The gift you buy for them now will play a monumental role in their development. This is the stage when a baby learns to walk and talk. Therefore, it is crucial that he or she has the appropriate gift. At the age of one, the baby is feeling the independence to explore the world. It is unlike anything he or she has done. This is a new realm. Make sure you surround the baby with items that are useful; he or she can have fun as well as learn few things with the gifts you provide them. It seems like a monumental task but we have created an amazing list for you. The following collection will help you a great deal. Noah’s Ark story is one of the most fascinating stories ever. You don’t have to be religious to enjoy it, it is more of a historical story. 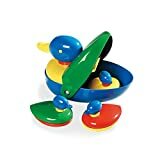 This paly set contains wooden items and objects are carefully designed so that a one year old can play with them and enjoy. You get pairs of animals, a large boat and ability to put animals in and out of the boat. The boat has holes from where you can see the animals. It makes a great toy for story-telling as well. 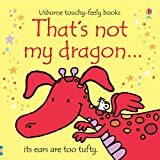 That’s not my… series by Usborne is a bit of cult classic when it comes to baby toys. The collection will publish its fiftieth title shortly. Pirates, mermaids, lions, tractors, cars, airplanes, no matter what your baby likes, there is a variation for it. The hard pages, cool illustrations and the touchy-feely elements make it a great gift. You can read it out to them or leave them with the book for a few minutes, either way it is tons of fun. There are hundreds of rockers to choose from, but we recommend this one for various reasons. This Little Bird Told Me rocker by Lambert is very sturdy. Unlike many other rockers, you don’t have to fear that it will fall apart. It has a nice face and a soft body that the child will love to stroke. 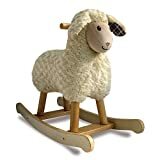 You can assemble this rocker in five minutes; all you have to do is attach the rockers to the lamb’s legs. With the Little Tikes Gas ‘n’ Go Mower, you can let the one year old have loads of fun while learning a thing or two about the real world. This pretend mower toy will spark the kid’s interest in lawn mowing and other outdoor activities. The baby will never get tired of pushing this colorful mower toy up and down in the back garden. This ingenious toy addresses the biggest problem kids have; carry their favorite books and toys with them. 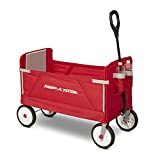 The Book Storage Cart is a beautiful pull-along trolley that allows them to do exactly that, only without making mess and keeping everything in order. If you want to buy a toy that instantly want to make you touch it and your toddler play with it, we have got the perfect idea for you. The Jellycat Tublie Sheepdog is the cutest and softest stuffed toy you will ever find. It is not too delicate either. Bath ducks are probably the most common items in kids’ bathrooms. However the Duck Family by Galt Toys stands apart. It is not a very realistic looking duck but it has vibrant colors that make it kids’ favorite. The cutest feature is that mother duck’s back opens up so that little ducklings can go inside. It is a toy for both bath-time and dry land. Lego is a timeless device, it is not a toy, and it is undoubtedly attractive for people of all ages. 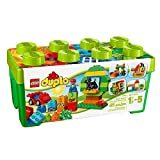 However Duplo is specially designed Lego range for children. The set includes windows, boy, dog, flowers and a wheel for a car to go with the basic brick set. Your child will learn a lot of mathematics, engineering and architecture while playing with Lego Duplo. This vibrant multicolored toy set makes for a great gift. The Early Learning Centre Happyland Funfair is made out of solid plastic. At one, most children put everything in their mouths so this toy set can act as a temporary teether as well. But it’s main plus point is the unlimited fun. It comes with three different rides a carousel, a rocket and pirate ship. There are three vehicles as well; ice-cream cart, train and a bus. All this goes with seven characters. If you didn’t have a train set growing up, your childhood was wasted. But don’t let it happen to your child. There is nothing that captures children’s imaginations like train sets. The manufacturers are calling in the “beginner back” because it is optimized for little children. It is made out of plastic and is completely safe to play with. Don’t think a lot, but it… your one year old will love it! Playmobil 123 range is specially designed for children from ages of one to three. There are no small parts or dangerous edges with any of the toys. We are huge fans of the Rescue Helicopter. It has a propeller and a pilot that is attired with fire-fighting clothes. Other toys include ship, house, police car and a recycler truck. Kids like to make noise. Their favorite toy is the loudest toy in their possession. Keeping view of that, we have brought forth a present that your baby will absolutely love. The Halilit Toy Xylohone will allow the baby to bash it with the playing sticks while making pleasant sounds. Petilou is a very useful toy range created by Le Toy Van. The manufacturers are renowned for creating beautiful wooden toys that are functional and look extremely good on the toy shelf as well. With Petilou the baby will create a tree, toadstool and a flower. He will then place an animal on each of the items. The switchable toy stacking means that the child can try multiple variations and create different garden every time. Tomy Aquadoodle contains a reusable mat that you can draw with on the water. It allows the kid to make impressions using brush, a built-in stamp or even by bare hands. When it dries up you can use it again. You get a set of various characters such as Minnie Mouse, Paw Patrol, Thomas the Tank Engine and Peppa Pig. The game is played when you dip these items in water and use them to draw on the map. What a brilliant idea! I would like to conclude by saying that one year olds don’t remember what you got them, frankly. But knowing that you did something useful for them, bought them a gift that makes them happy and teaches them a few things is one of the best feelings in the world. If you are buying these gifts for kids of a friends and family, I guarantee you that you will capture their admiration for the rest of your life.